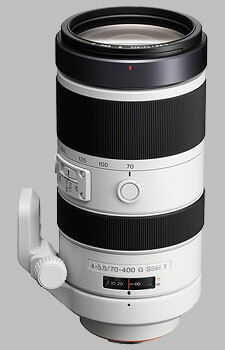 (From Sony lens literature) Sony’s G lens line-up is strengthened for 2013 with the revised 70-400mm F4-5.6 G SSM II. Ideal for capturing wildlife and action-packed sports, the upgraded super-telephoto zoom builds further on the premium performance of its predecessor with enhanced optics and faster, more responsive autofocus. Thanks to a new LSI drive circuit, autofocus speed of the SSM (Super Sonic Wave Motor) is around four times quicker than before. Teamed with enhanced tracking AF, the upgraded lens is now even more suitable for capturing stills and Full HD video of fast-moving subjects. While its optical design is carried over from the previous-generation model, the new-generation lens features Sony’s proprietary Nano AR Coating on optical surfaces. Offering around five times the efficiency of conventional anti-reflection coatings, this advanced technology reduces flare and ghosting for exceptionally high-contrast images. The Sony 70-400mm f/4-5.6G SSM II SAL70400G2 doesn't have any user reviews yet!